As the year draws to a close, 2015 has turned out to be the year of the show biz documentary. From an Academy Award winning actor to a Grammy Award winning singer, these docs have offered a peek into the private lives of some of entertainment's legendary personalities, both in and out of the spotlight. There has also been looks at those fans who love their favorite movies, iconic characters and even classic toys a little — OK, a lot — more than your average person. And the best of the lot looked back at two outsize personas who mesmerized America by openly hating each other on television decades before reality TV existed. Three beloved chanteuses from three vastly different eras are the subjects of Amy, What Happened, Miss Simone? and The Outrageous Sophie Tucker. Of these, Amy (now on DVD/Blu-ray) has the highest profile and has already won a handful of awards as well as Oscar front runner status. 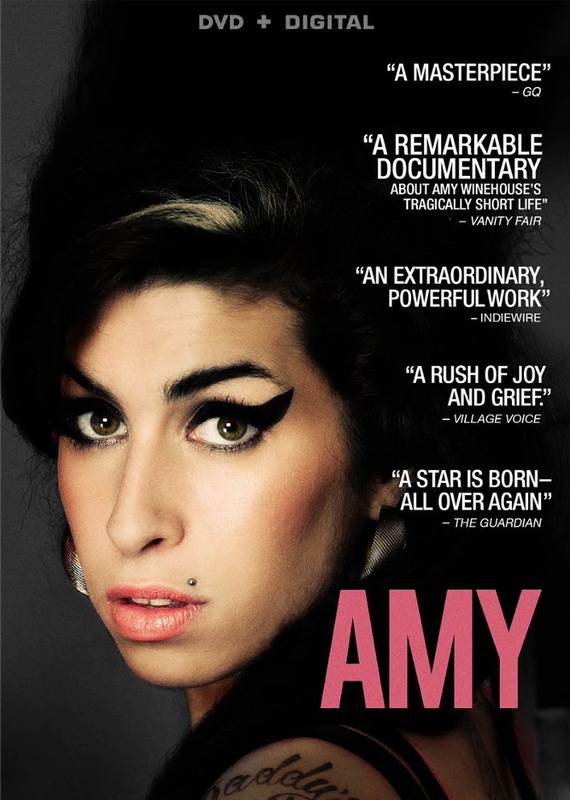 Using Amy Winehouse's own voice (via never before seen home videos and the like), director Asif Kapadia paints a fascinating portrait of an artist so overwhelmed by fame that it engulfed her. You'll feel retroactively guilty for all those "Amy Wino-house" jokes you laughed at years ago. Nina Simone also followed a similar self-destructive path, although her abusive manager/husband certainly contributed to her many ills. 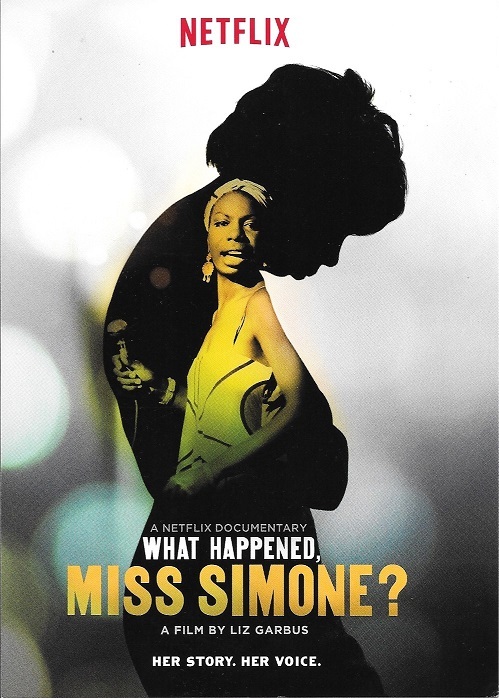 Her oft-estranged daughter provides the most compelling interview footage in the film (now streaming on Netflix), while Simone's own writings bring to light the deep psychological issues fueled by years of racism that ultimately took over her life and destroyed her career. On a much lighter note, The Outrageous Sophie Tucker (now available on DVD and Amazon Prime) is a loving look at the bawdy singer mostly known nowadays as a key influence of Bette Midler's. 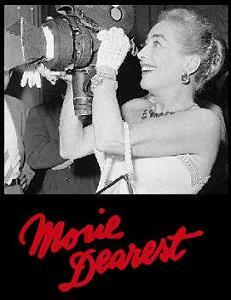 She of course was much more than that, and this biodoc provides a good avenue to discover her and her musical legacy. 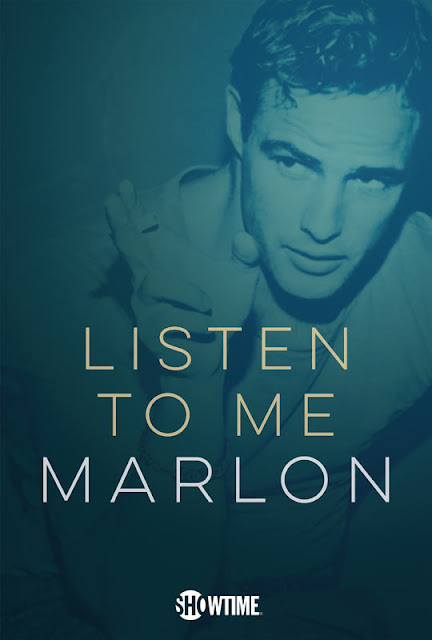 Although they became movie stars at roughly the same time, it is highly doubtful that Marlon Brando and Tab Hunter competed for roles. The latter was the ultimate blue-eyed boy next door, while the former was the original bad boy (and yes, there was that significant divide in their talent levels as well). Like Amy, Listen to Me Marlon (available on Showtime On Demand) uses a wealth of the artist's personal recordings (here on audio cassette) to provide hitherto unexplored access to the man behind the Method. (And, also like Amy, Brando's bisexuality is completely ignored.) Brando's oft-reported eccentricities make more sense in his own words, but some odd directorial choices lessen the overall impact. Following his documentaries on such gay icons as Divine, Vito Russo and Jack Wrangler, director Jeffrey Schwarz now gives us Tab Hunter Confidential, based on Hunter's autobiography of the same name. 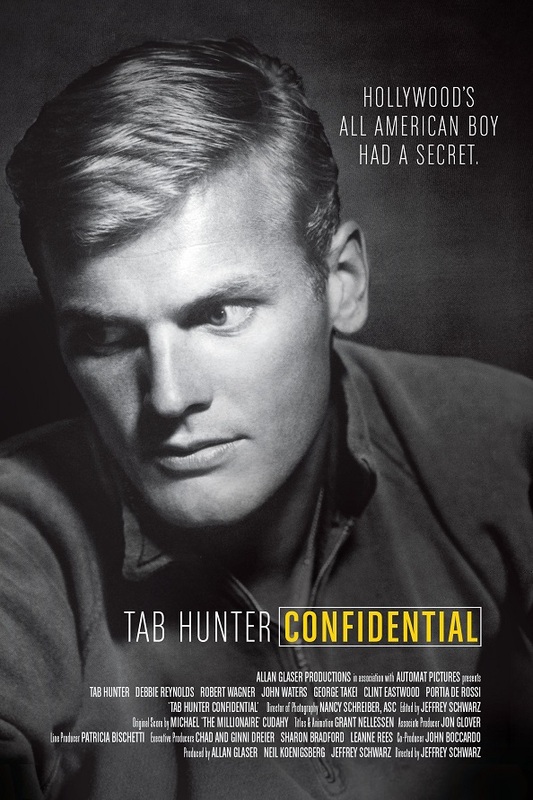 A fascinating look at an era of deep closets in Hollywood, Confidential is at its most enjoyable when it coyly presents vintage footage of Hunter (who came out via his book in 2006) at odds with his then straight-laced image. The former matinee idol (now content to just tend to his beloved horse) also goes into detail about his relationship with another closeted star of the time, Anthony Perkins. Much was made of October 21st of this year, a.k.a. "Back to the Future Day", the exact date that Marty McFly and Doc Brown traveled forward in time to in the 1989 sequel Back to the Future Part II. It was a lot of fuss for what was a pretty awful sequel to a purely original classic that continues to spawn subpar follow ups, including the new documentary on its legacy, Back in Time (available on DVD and Blu-ray and now streaming on Netflix). Credit is due for rounding up all the BTTF cast and creators, but the amateurish production too skews heavily toward the die hard DIY DeLorean fans (some who even claim Part II is the best of the trilogy?!?). Speaking of obsessive movie fans, you'll find none more so than the Angulo brothers, a.k.a. 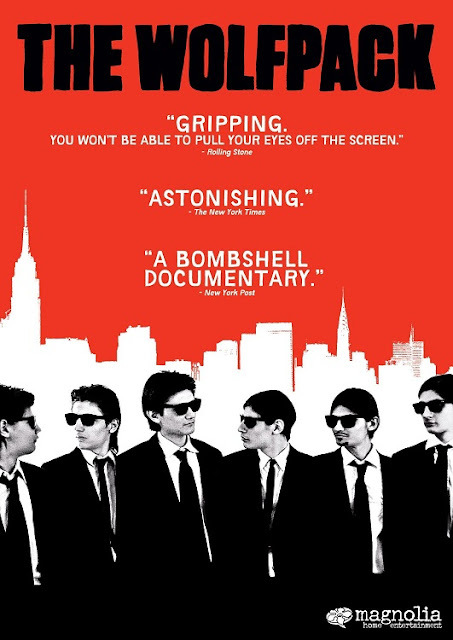 The Wolfpack (on DVD/Blu-ray and Netflix streaming). Confined to their tiny, cluttered New York City apartment for most of their lives by a controlling father, the six brothers find escape in not only watching their favorite films but also meticulously recreating them with homemade costumes, sets and props. What at first is fascinating in a voyeuristic way is ultimately frustrating as director Crystal Moselle (who became very close to the family while filming) leaves many questions maddeningly unanswered, not the least of which is how Mr. Angulo got away with years of child abuse. Another, far less dysfunctional family is at the center of Batkid Begins (available on DVD). Miles Scott, a 5-year-old cancer survivor, had his dream come true one day in 2013 when he became "Batkid", the pint-sized sidekick to his favorite superhero Batman. In what quickly steamrolled into the largest and most elaborate Make-a-Wish project ever, the entire city of San Francisco and more turned out for the event, which had become a global social media phenomenon. While lightweight, the family friendly doc is an inspirational one that proves that the goodness of humanity can still triumph in this day and age. While also exploring the long and varied history of the popular plastic building blocks, A Lego Brickumentary (on DVD/Blu-ray and Amazon Prime) features sequences of the various, often unlikely, uses of Legos, from engineers to artists to, of course, fans, from elaborate home-made designs (most impressively a huge miniature recreation of Rivendell from The Lord of the Rings) to stop motion animated mini-movies. Although clearly sanctioned by The Lego Group (the only ones who insist on calling them "Lego bricks" instead of just "Legos"), this "brickumentary" is, like the toy, colorful and fun for the whole family. These days we're used to seeing real people screaming at each other (and worse) on television, but back in 1968 it was such a novelty that it revitalized a whole network's news division and changed televised political reporting forever. As detailed in the engrossing documentary Best of Enemies (available on DVD, Blu-ray and Netflix), a struggling ABC News figured "why not?" 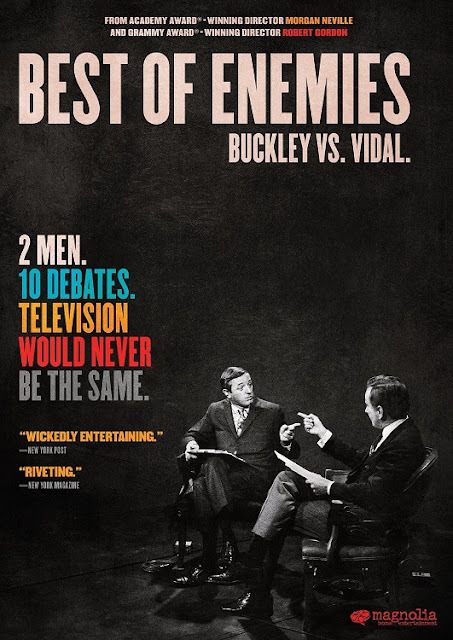 when they decided to pit two verbose intellectuals — conservative pundit William F. Buckley, Jr. and controversial author Gore Vidal — against each other on live TV to debate over the Republican and Democratic National Conventions. From the very first telecast, it was all too apparent that the two actively loathed one another and weren't afraid to say it to the others' face in every as-wittingly-phrased way as possible. Audiences started watching, and by the time a blustering Buckley, in response to being referred to as a "crypto-Nazi", called Gore a "queer" on live television, ABC had struck ratings gold. But it is what happened to Vidal and especially Buckley after the debates that Best of Enemies strikes gold, showing just how damaging such a public spectacle can be. American intellectualism never fully recovered. Note: Amy, Best of Enemies, Listen to Me Marlon and What Happened, Miss Simone? are among the fifteen finalists for this year's Oscar for Best Documentary Feature. For even more 2015 show biz docs, see also the MD Reviews for An Honest Liar, I Am Big Bird: The Caroll Spinney Story, Electric Boogaloo: The Wild, Untold Story of Cannon Films and Tig. Happy holidays! 'Tis the season once again for Santa, menorahs, ugly sweaters and obligatory office parties. Three Long Beach theatre companies are also bringing us the latest installments of their traditional December offerings. 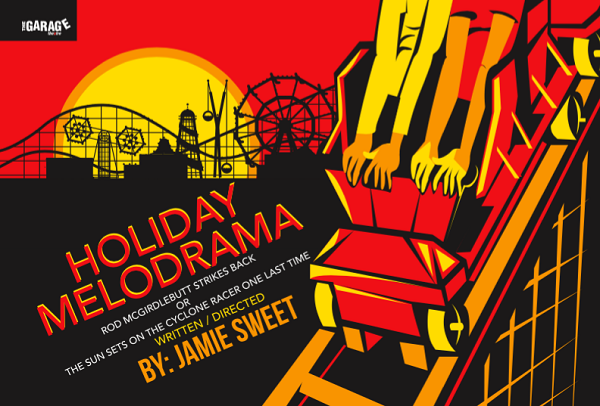 The Garage Theatre's annual family-friendly holiday melodrama, now in its 12th year, is Rod McGirdlebutt Strikes Back, or The Sun Sets on the Cyclone Racer One Last Time. This new chapter in the ongoing saga of a heroic roller coaster operator fighting the villainous Ian Sidious for control of the since-shuttered Pike boardwalk is set in 1956. Combining Long Beach nostalgia with references to modern cultural touchpoints like the Star Wars and Back to the Future films proves to be a winning formula. Mickey Mouse, Elvis Presley and Ronald Reagan also make appearances but they aren't the inspiring figures here that their fans are accustomed to. Sidious (played by Joe Howells in most performances but by Craig Johnson a couple of times) is once again out to take over the Pike. This time around he has the help of a time machine developed by the equally sinister Dr. Lucifer Prince (Paul Knox, who also does a terrific Joe Cocker impersonation). In addition to McGirdlebutt (endearingly played by Rob Young), those intent on foiling the pair include reporter Dixie Troobaloo (a somewhat underused Jami McCoy), imprisoned whistleblower Ging Pao (Sally Nguyen), the dimwitted Jim Joe Bob Louie the 4th (Matthew Vincent Julian) and an alligator named Alice (a charming Jacqueline Jacobs), who happened to study law at Yale. Jamie Sweet, who wrote and directed the production, fills it with "smoke, lasers, flying objects and guffaws," to quote the program cover. Although it could be trimmed by a good half hour to better accommodate their attention spans, kids will likely enjoy the overall silliness and interactive nature of the show. Audience members are instructed in how to cheer or hiss its various heroes and villains, and are also provided generous quantities of stuffed felt tomatoes and fake flowers with which to shower Sidious, Prince or Dixie. While there actually isn't any Christmas content in Rod McGirdlebutt Strikes Back aside from some cool red and green laser lights, the show can still serve as a holiday treat for the whole family. 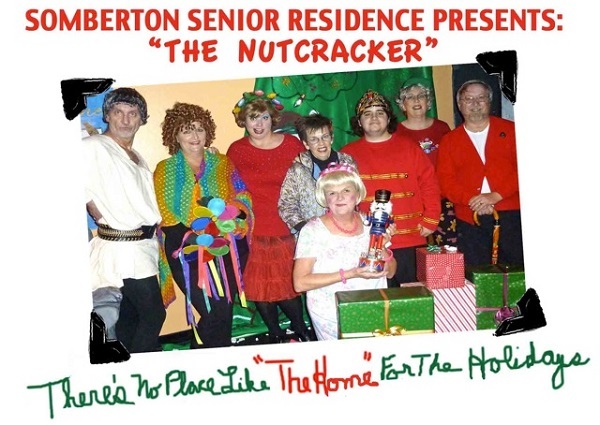 Somberton Senior Residence Presents The Nutcracker, now in its fourth year at the Found Theatre through January 17th, is more adult-leaning but more specifically Christmas-oriented. Set in a retirement home chock-full of (mostly) happily demented oldsters, it is also an interactive affair. Attendees are welcomed to each performance as new residents and given little cups of candy "medication" and/or nuts. One audience member at the matinee I attended was even ordered to wear a hospital gown. Presided over by the strict Nurse Jessica (Joyce Hackett), resident activities include playing Bingo, watching Jeopardy and, during this time of year, participating in their annual holiday show for family members. Kevin Gillespie (played by stage and film vet Derek Long) is the director recruited to stage the event and he quickly finds himself flummoxed. 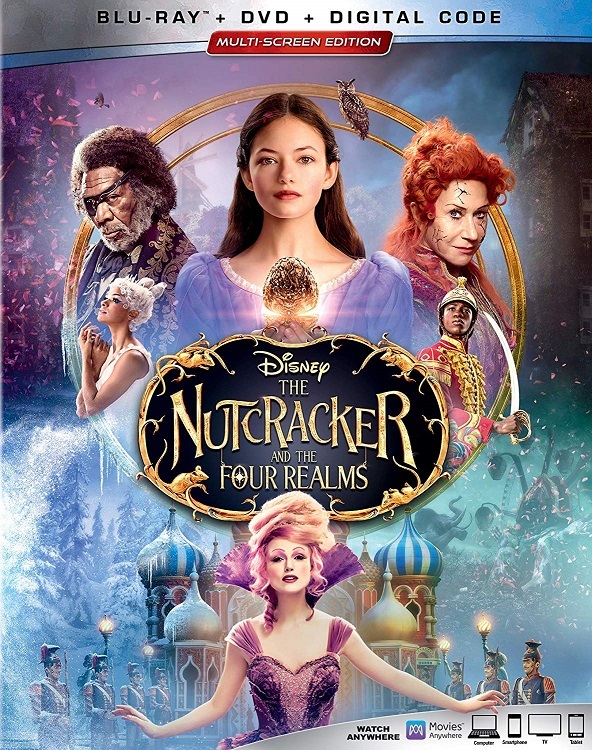 Wrangling a cast that includes a woman who thinks she is Judy Garland, a flamboyantly gay former dancer and a man confined to a wheelchair would try anyone's patience. In the end, though, Gillespie pulls it off with a scaled-down but still impressive Nutcracker performance complete with traditional growing Christmas tree. Kudos to the Found production's director-choreographer Lauren Nave and her cast, most of whom doubled as the production's set and costume designers, for their endlessly clever work here. I've seen many productions of The Nutcracker over the years, most of them interchangeable. I won't soon forget this uniquely hilarious version presented by the Somberton Seniors. Each December brings hundreds, possibly thousands, of stage adaptations around the world of A Christmas Carol. Since its publication in 1843, Charles Dickens' yuletide tale of miserly Ebenezer Scrooge's spiritual and moral conversion has been told in traditional as well as more contemporary ways. One of the most innovative and entertaining interpretations I've seen was a circus-set version that Long Beach's ICT presented for several years. 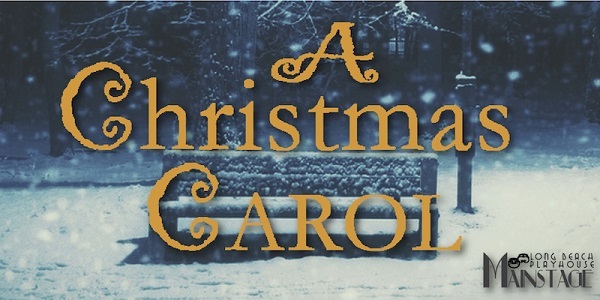 Long Beach Playhouse's 4th annual production of A Christmas Carol is playing in their Mainstage theater through December 20th. Phie (shortened from Sophie) Mura, a frequent Playhouse cast member, is making her Mainstage directorial debut. As she notes in the program, "This story has been told, again and again ever since (its initial publication). It has an undeniable link to the human heart and spirit that we cannot seem to shake, nor do we want to." Very true indeed. The character of Scrooge needs no introduction, as his name has become synonymous over the last century and a half with greed and a callous disregard for his fellow human beings. He receives a forced lesson in compassion on Christmas Eve courtesy of the spirit of his deceased former partner, Jacob Marley. Plus the Ghosts of Christmas Past, Present and Future, of course. An interesting but unnecessary conceit of this otherwise straightforward telling, adapted from Dickens by Mura and Gregory Cohen, is the addition of a number of other ghosts. In fact (mild spoiler alert), all the actors in its play-within-a-play format turn out to be ectoplasmic. However, only one of the spirits is briefly scary enough for parents of young children to be mildly concerned. The production is fine family fare complete with music, dance and a puppet or two. Kids will also enjoy another of Mura's unusual directorial choices: having the actors portray such non-human elements as a coat stand, the fire in Scrooge's fireplaces and even the curtains around his bed. Critical to the success of any stage, film or TV version of A Christmas Carol is the actor cast as Scrooge. For every Alastair Sim, George C. Scott or Michael Caine who has played the role there is a Henry Winkler, Kelsey Grammer and Jim Carrey. Thankfully, Gregory Cohen excels at the Playhouse. His is a somewhat livelier, funnier take on the curmudgeonly character than most but Cohen makes Scrooge's gradual change of heart palpable. He and Rick Reischman, who plays Scrooge's ever-optimistic nephew Fred, also jointly provide a lovely commendation of Scrooge's late, beloved sister in the play's most moving moment. Other performances deserving of mention are Steve Shane's sympathetic Marley, Ashley J. 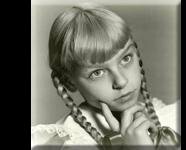 Woods as Belle and young Carmel Artstein as Tiny Tim and other children's roles. Talented actor-dancer Leigh Hayes makes a more youthful (not to mention male) Ghost of Christmas Past than normally presented, while Gary Douglas and Reischman serve well respectively as the Ghosts of Christmas Present and Future. Despite its undead cast of characters, A Christmas Carol at Long Beach Playhouse will be a lively addition to one's holiday celebrations. Considering he is one of the most influential entertainers of the 20th Century, Walt Disney has, surprisingly, pretty much eluded the big screen biopic treatment. Aside from supporting turns in the TV movie A Dream is a Wish Your Heart Makes: The Annette Funicello Story and the Disney Studios' own Saving Mr. Banks (played by Tom Hanks), "Uncle Walt" hasn't even appeared many times as an onscreen character, although he has been the subject of such documentaries as the Disney Family-approved Walt: The Man Behind the Myth and this year's excellent Walt Disney via PBS' American Experience. So it is ironic that not one but two screen biographies of Disney have appeared in the last two years, both low budget attempts from small independent studios and both focusing on his early years as a struggling animator prior to making it big thanks to a certain cartoon mouse. The first was last year's low-rated As Dreamers Do (now available on Amazon Prime) while the second, Walt Before Mickey (a.k.a. 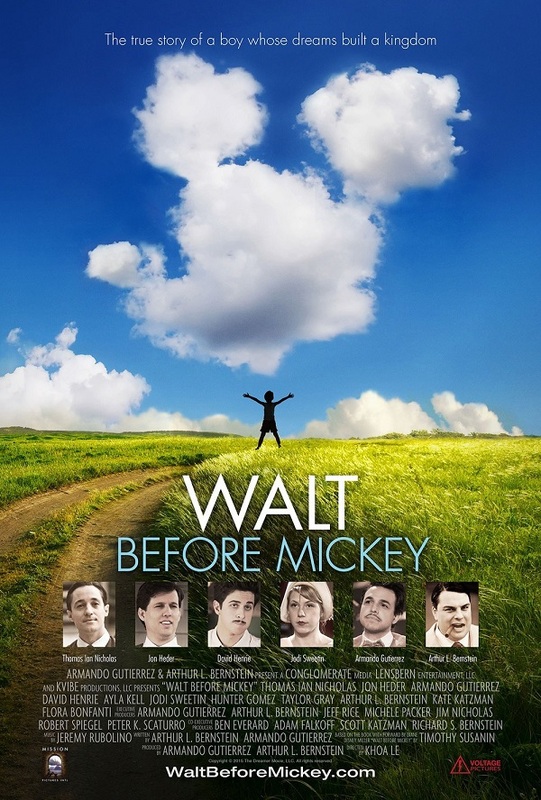 The Dreamer) was just released yesterday on what was the 114th anniversary of Walt's birth. Of the two, the latter at least has some name recognition in the cast, with American Pie's Thomas Ian Nicholas as Walt and Napoleon Dynamite himself, Jon Heder, as his sensible older brother Roy. Sadly, the film doesn't have much more going for it aside from those meager assets, bogged down as it is by a screenplay (adapted from the book of the same name by Timothy Susanin by the film's producers Arthur L. Bernstein and Armando Gutierrez, who also plays legendary animator/co-creator of Mickey Mouse Ub Iwerks) laden with trite homespun platitudes ("Anything worth doing is worth doing well") and clunky allusions to its main character's impending greatness, visualized by director Khoa Le as, you guessed it, a friendly mouse that magically shows up when Walt needs him most. Like cute animal sidekicks, every Disney movie (even, apparently, movies about him) has a cackling, over-the-top villain to jeopardize the protagonist's happily ever after, and here it is Charles Mintz (Conor Dubin), distributor of Disney's early Alice comedies (a series that combined a live action little girl's adventures in an animated wonderland), who eventually screwed Walt out of ownership of his work and poached his artists out from under him. This lead to Walt's last ditch shot at success, his near-mythic creation of... Mortimer Mouse (later, thankfully, renamed Mickey). 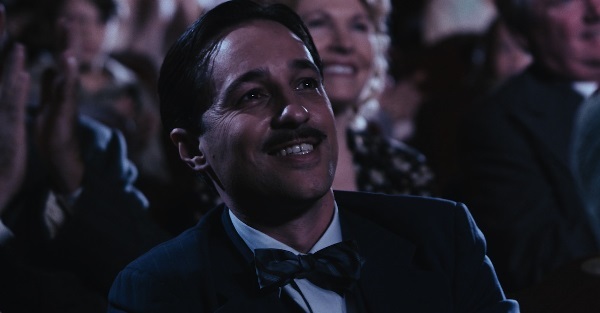 While Walt Before Mickey certainly has its heart in the right place, it can't overcome its mostly amateurish cast (I don't know who is worse, Kate Katzman as Walt's wife Lillian or Frank Licari as Mintz's Boris Badenov-accented lackey) and low production values (the costumers and prop crew must have got a great deal on white men's dress shirts and non-filtered cigarettes considering their practically fetishized onscreen abundances). As it is, we're still waiting for that big budget, complete biopic of the man behind the mouse; we've always imagined a splashy Hollywood musical would be best. Movie Dearest is giving a special gift this December, a Calendar Wallpaper salute to one of our favorite actresses, the one and only Judi Dench. 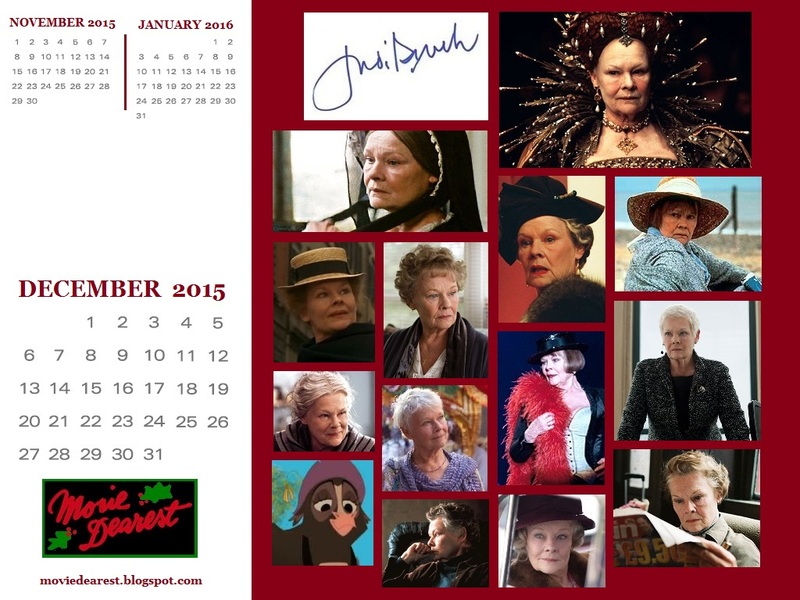 Dame Judi turns 81 this month, and to honor her we have all her award winning roles, including two queens, two lesbians, a movie star and a cow. Whether she is Mrs. Brown or Mrs. Henderson or just plain "M", we love our Judi.